Everybody knows what the Google Search Engine Results Page (SERP) looks like. We’ve all been there. We cross that page with every search we do. Still, the page can look rather different depending on what you’re searching for. And, which of those results are paid for and which are not – the organic ones? In this post, I’ll explain all the elements of the Google Search Engine Results Page. What the result page looks like largely depends on what you are searching for. If you’re searching for a product you can buy, Google will show shop results on the SERP. 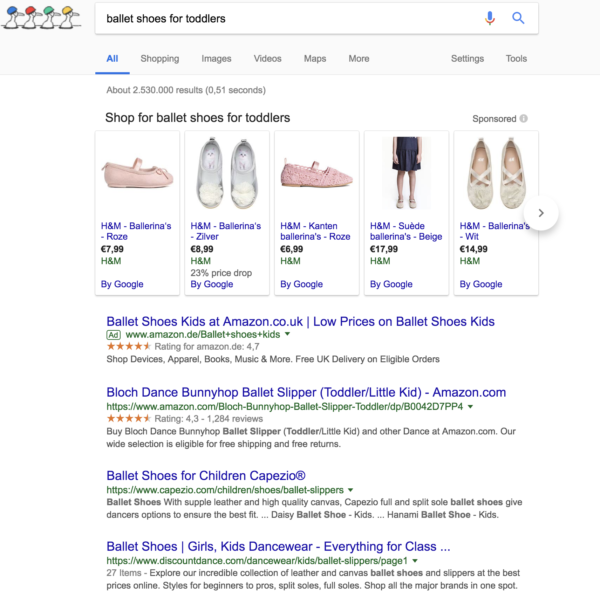 Like in this example, when I was searching ballet shoes for a toddler. This results page starts with shopping results, the ones with the images on top. To get there, you’ll have to pay Google – note the word ‘sponsored’ in the upper right corner. After those results, the first result is an Ad, another paid result. And then the organic results start. These search results do not show any paid or sponsored results. 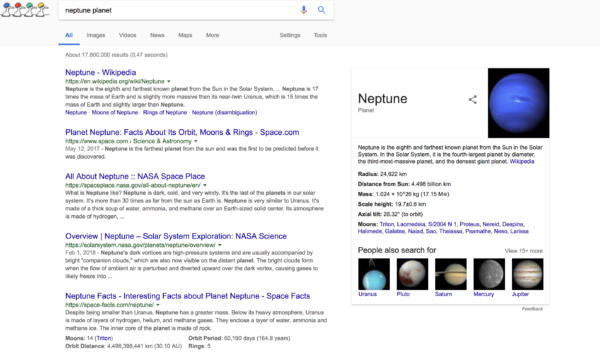 And on the right end, you’ll notice a knowledge graph with lots of information about the planet Neptune. The default page of Google’s search result is a page on which different results appear. Google decides which results fit your search query best. That could be ‘normal’ results, but also news results, shopping results or images. If you’re searching for information, a knowledge graph could turn up. When you’re searching to buy something online, you’ll probably get lots of shopping results on the default result page. If you want to, you can apply some filters on the search results yourself. You can, for instance, click on ‘images’ if you’re searching for an image. This allows you to browse through images only. You can also choose ‘shopping’, ‘videos’, ‘news’ and ‘more’. Google shows both paid results and organic results. It can be pretty hard to notice the difference between the two. The ads usually appear on top of the search results. Sometimes it’s only one ad, but Google can show more ads as well. This depends on how many people search for a certain search term and who wants to pay for it. You’ll recognize the paid result by the word Ad shown in front of the link to the website. The shopping results in Google are also paid results: a company pays Google to appear in the shopping results. If you want to advertise on Google you should check out Google Adwords. The organic results in Google are all of the results that are not paid for. The organic results that are shown first are the results that fit the search query of the user best, according to Google’s algorithm. Search Engine Optimization (SEO) is aimed to improve the chances to rank in the organic search results. In this snippet, a picture of the ice cream is added, you can see the rating of the recipe, the time it takes to prepare this type of ice cream and the number of calories it contains. A rich snippet contains much more information than the normal snippet does. Besides snippets, images, videos, news results, shopping results and maps, Google also shows some other elements on the SERPs. The Knowledge Graph box appears on the right side of the search results. According to Google, this information is retrieved from many sources, including the CIA World Factbook and Wikipedia. Information from the Knowledge Graph is used to answer spoken questions in Google Assistant and Google Home voice queries. An answer box appears somewhere between the organic search results. It’ll give suggestions for questions that relate to the search query you typed in. If you’re searching for Yoast SEO you’ll encounter this answer box between the organic search results. Clicking on one of the suggestions will give a direct answer to the specific question. 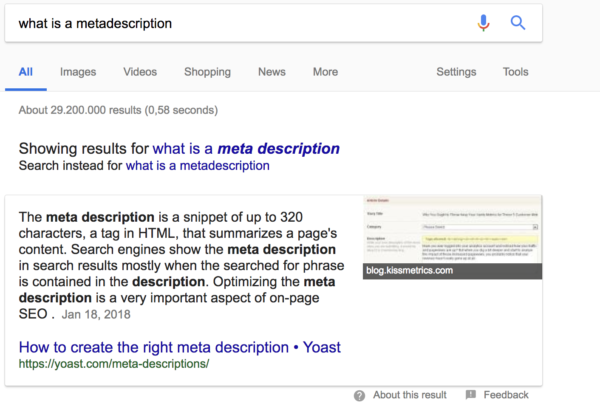 A featured snippet is a highlighted search box that answers the question you type in the Google search bar. This featured snippet box is situated above the regular organic search results. Featured snippets often appear as a paragraph or a bulleted list, accompanied by an image. 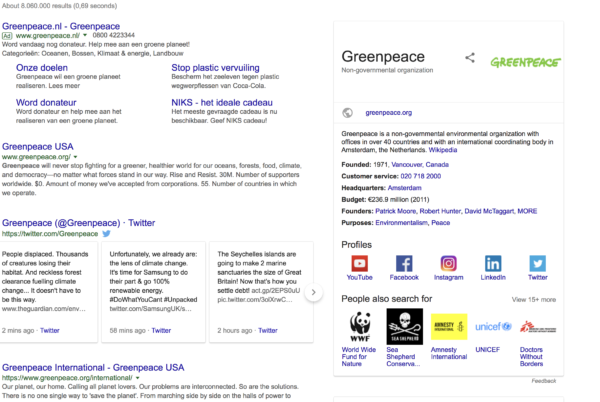 Google’s SERPs can show various elements: the search results themselves (so called snippets), a knowledge graph, a featured snippet, an answer box, images, shopping results and more. Depending on the type of query and the data Google finds, some of these elements will show up. You can add data to your page, so Google can show a ‘rich’ snippet, providing more information about your product or recipe, for instance. 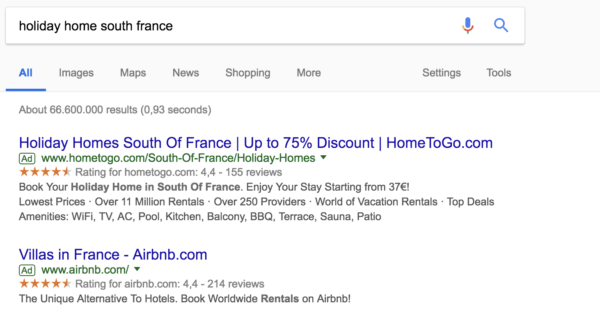 You can pay Google to make the snippet of your page end up high on the search results page as an ad. 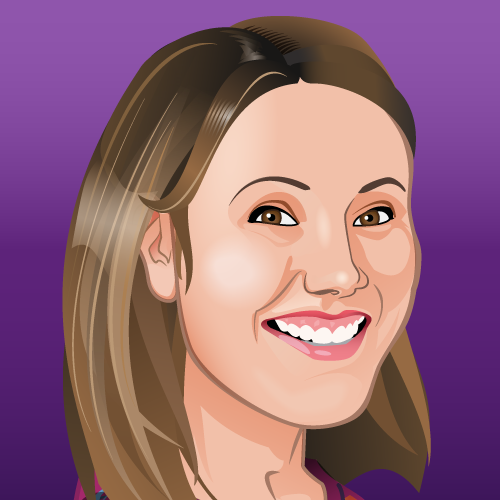 Or, you can optimize your pages for the search engines – and users! – so it will rank high organically. That’s SEO, and that’s what we write about!